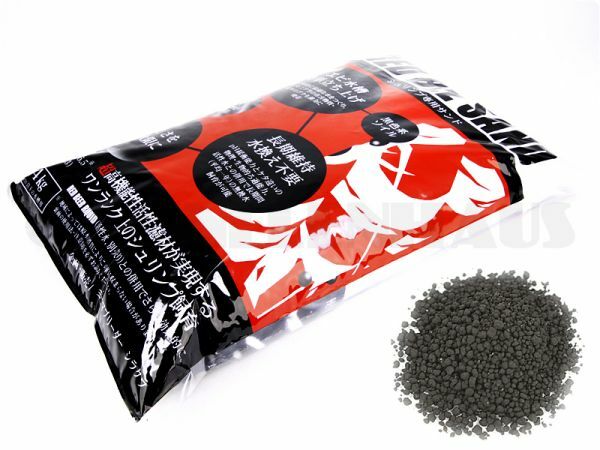 Shirakura Red Bee Sand - substrate (soil) was especially developed for breeding Bee shrimp. In cooperation with the manufacturer, Takayuki Shirakura was able to improve and optimize this soil substrate. They have been friends for years and were working to get the best possible product for keeping and breeding Bee shrimp. This soil is manufactured in a special procedure using different fired earths, and it has the property to permanently lower and stabilize the water parameters of carbonate hardness and pH value, which are so important when it comes to shrimp-breeding. The pH that is adjusted is around 6.5 +/- 0.3. For breeding Bee shrimp, you'll need a carbonate hardness (KH) of around 0 - 2 and for avoiding ammonia you'll need a pH value of under 7. When the total hardness (GH) you can measure is lower than 5 °dH you should raise it using *Shirakura Liquid Mineral Ca+* to avoid moulting problems for your shrimp. Shirakura Red Bee Sand does not contain fertilizers and is absolutely harmless for shrimp. Its highly porous structure provides bacteria and other important microorganisms especially needed by baby shrimp for healthy development with an enormous surface to settle on (please see *Shirakura Chi Ebi* - baby shrimp food). Especially if you use undergravel filters, Red Bee Sand offers optimal conditions for biological water cleaning and thus for the best water qualtiy. Do not rinse before use. You may start setting up your tank right away.